With no jackpot winner in Friday night’s drawing (see results below), the Mega Millions lottery increases to a $654 million payout (with a cash option of $372 million) for the next numbers. 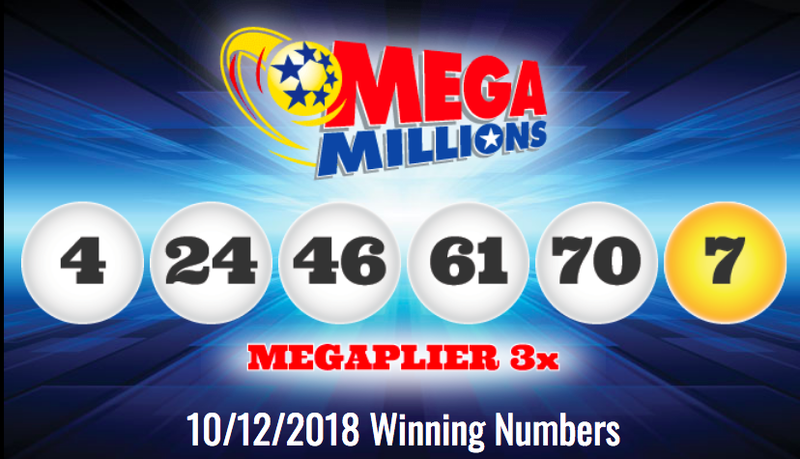 In Friday’s drawing on 10/12/18, one player in Arkansas had a ticket matching five numbers, claiming $1 million (the player also played the Megaplier option, increasing their winnings to $3 million) The Mega Millions numbers for Oct. 12 were 4-24-46-61-70; the Gold Mega Ball was 7; the Megaplier was 3. So, if you want a chance at winning one of the biggest Mega Millions jackpots ever early next week, you have until Tuesday at 10:50 p.m. in most states to purchase a $2 entry ticket. Your odds of winning the Mega Millions overall jackpot is one in 302 million, according to the lottery. Experts say that picking your own numbers in the biggest lotteries like Powerball and Mega Millions may not be the best bet. (RNN) – The $548 million Mega Millions jackpot numbers were drawn on Friday night as 70, 24, 46, 4 and 61, with a Mega Ball of 7. The prize is $2 million shy of the all-time highest Mega Millions jackpot of $656 million. The grand prize had increased to the third-largest jackpot in the lottery’s history for Friday’s drawing after no tickets matched all the numbers in the Tuesday drawing. If someone buys a winning ticket for the next drawing, they could take home the second-highest jackpot in Mega Millions history, and the fourth-largest lottery prize in U.S. history. The next jackpot winner will need to match numbers on all five white balls and the Mega Ball. RELATED: Luckiest lottery stores in Arizona, see where highest payouts occurred The $548 million jackpot Friday would have been the third-largest in Mega Millions history.